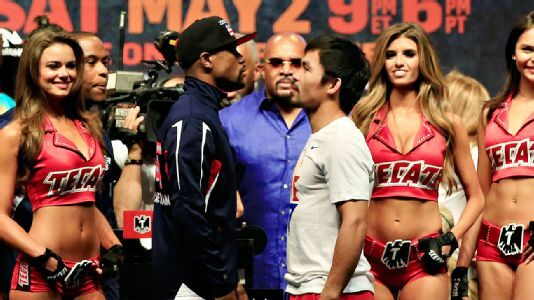 According to ESPN Manny Pacquiao and Floyd Mayweather stepped on the scales last night at the packed MGM Arena and then came face-to-face and the crowd went wild one day before they’ll meet in battle some are calling the fight of the century. Pacquiao, the clear crowd favorite, got on the scale first, weighing 145 pounds. 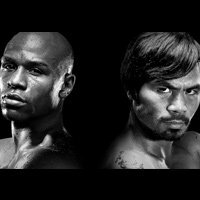 The champion Mayweather was 146 pounds for a fight that will unify their three welterweight world titles and decide the pound-for-pound king of the ring. The arena was open for the sold-out weigh-in as just under 12 thousand fans paid $10 apiece for the chance to get a glimpse at boxing royalty since most, like you and I, will be watching on TV. The money raised was all earmarked for charities determined by the boxers. Afterwards they came face-to-face for an epic staredown. It was only the third time they’ve seen each other during the fight hype. The pair will see each other one more time at approximately 10:15 p.m. CT on (Showtime PPV/HBO PPV). The pre-fight hype chatter is over, the weigh-in complete… nothing left to do now but FIGHT! Where will you watch the fight? Who do you want to win? Will there be a rematch?